The National Pharmaceutical Pricing Authority (NPPA), an independent body of experts in the Ministry of Chemicals & Fertilizers was formed by the Government of India. The functions of NPPA, inter-alia, relates to fixation/revision of prices of scheduled bulk drugs/ formulations under DPCO’1995 monitoring and enforcement of the prices. The Authority has been entrusted with the task of price fixation/ revision and other related matters such as updating the list of drugs under price control by inclusion and exclusion on the basis of these established criteria/ guidelines. The Authority is empowered to take final decisions, which is subjected to review by the Central Government as and when considered necessary. The Authority is also required to monitor the prices of decontrolled drugs and formulation and oversee the implementation of the provisions of the Drugs (Price Control) Order. NPPA also monitors the availability of drugs throughout the country and take corrective action if any shortage of medicines is noticed. With a view to keep a close watch on price changes, monitoring mechanism is in place. The monitoring of prices of non-scheduled formulations is currently done on the basis of data from IMS Health. The ceiling for annual price increase has been reduced to 10 percent from 20 percent since 01.04.2007. Prices of 30 non-scheduled medicines have been fixed under para 10(b) till August, 2012, the details of which are available on NPPA’s website. 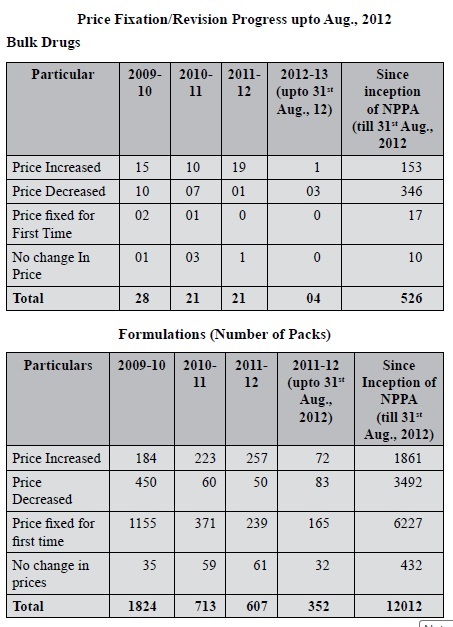 As a result of action under this provision, 33 manufacturers have voluntarily reduced prices of 65 packs and prices of 30 packs has seen fixed by NPPA. In this way prices of 95 non-scheduled packs have been reduced so far. Availability of Drugs NPPA monitors the availability of drugs and identifies shortage, if any, to take remedial steps to make the drugs available. NPPA is carrying out this responsibility mainly through monthly field reports from the State Drugs Controllers and other available information. As and when the reports of shortage of particular drug(s), in any part of the country are received, the concerned company is asked to rush the stocks and to make the drugs available. Generally, shortages reported are brand specific where alternate brands are available. Enforcement of provisions of DPCO, 1995. (ii) Examine complaints by ndividuals / NGOs/VIP references. (ii) Fixation of prices, where ever required. Demand notices for overcharging have been issued from inception of NPPA. India has some of the poorest health indicators in the world and highest disease burden. This makes all the more important that the medicines need special priority from Government, Trade Associations, Industry and Consumer Organizations. Within healthcare, the cost of medicine is the major cost driver which constitutes nearly 60-70 percent of the total healthcare cost. 80- 90 percent of health care in India is out of pocket without intermediation and risk buffer of health insurance. The scenario underscores the criticality of containing drug costs for affordable healthcare. 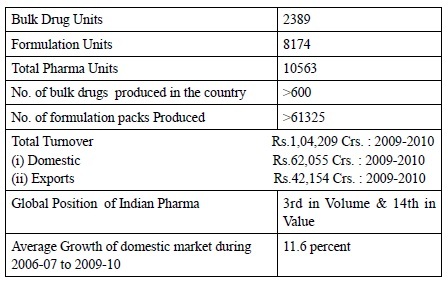 India is recognised worldwide as a low cost producer of quality drugs. Indian Pharma Industry is making all out efforts to ensure availability of medicines and taking India to a leadership position in Global Pharmaceutical Arena. Government is taking all necessary steps in supporting the Indian Pharma Industry by ensuring adequate availability of highly skilled and trained manpower, rationalising taxes, providing various fiscal and non-fiscal incentives for R & D and minimal price control. NPPA with the assigned mandate endeavours to maintain a balance in the conflicting interests of the consumers and producers. An effort is made to make the consumers vigilant of his rights in respect of quality of the medicines and prices charged overtime. At the same time while fixing the prices of Bulk Drugs/ Formulations it is ensured that justice is being done with all rationality and objectivity in its approach. Information system relating to how medicine prices change in a country reported by a national medicine price monitoring system can be a valuable tool for governments, policy makers, health professionals, civil society and other interested local or international parties for decision making, evaluation and advocacy purposes. NPPA has increased its focus on the monitoring prices more and has made appropriate interventions. While significant ground has been traversed, much more endeavours to be covered within the mandate of DPCO, 1995. By : C P Singh , Chairman, National Pharmaceutical Pricing Authority (NPPA).